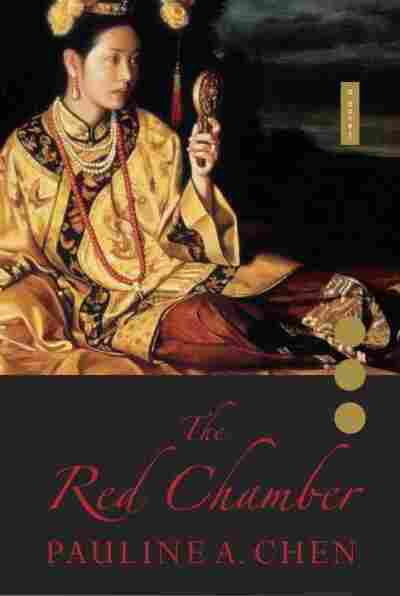 In 'Red Chamber,' A Love Triangle For The Ages Before most Chinese readers learned of Romeo and Juliet, they fell for Dream of the Red Chamber. The 18th-century novel follows a love triangle between a boy and his two female cousins. It's been called China's greatest literary work, and now a new adaptation hopes to introduce it to an American audience. 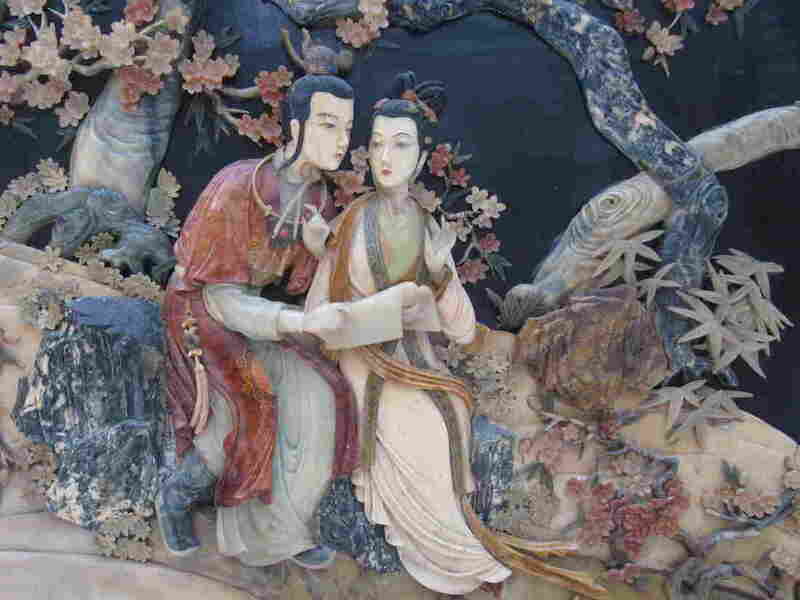 The romance between star-crossed lovers Jia Baoyu (left) and Lin Daiyu, depicted here in a relief panel, meets a tragic end in the classic Chinese novel Dream of the Red Chamber. Before most readers in China learned of Romeo and Juliet, they were captivated by a love triangle between a boy and his two female cousins. It's the "single most famous love triangle in Chinese literary history," says author Pauline A. Chen, who's written the latest retelling of the tale of Jia Baoyu and his cousins Lin Daiyu and Xue Baochai. The three characters form the central love story of the Chinese novel Hong Lou Meng, often translated as Dream of the Red Chamber in English. Chen's adaptation of the 18th-century novel shortens both the title (to The Red Chamber) and the notoriously long plot in hopes of introducing more English readers to a Chinese classic. The original tale, by Cao Xueqin, follows the decline of a well-to-do family at a time in China when an emperor still lived in the Imperial Palace, marriages were arranged and romances between cousins were socially acceptable. The novel features 400-plus characters, and the full English translation is more than 2,500 pages long. The book is so multilayered that it even has its own academic field, known as Redology. But Chen's adaptation boils down the original story to focus, in part, on that famous triangle that just about everyone in China knows. Here's the Cliffs Notes version: Boy meets girl No. 1; then boy meets girl No. 2. Boy likes them both, but he's in love with girl No. 1. So [spoiler alert] when the boy is forced into an arranged marriage with girl No. 2, tragedy ensues. The Chinese 'Gone With The Wind'? Chen says it's a story that American readers may recognize; she sees a "strange resemblance" between the novel and Margaret Mitchell's Gone With the Wind. For decades, the earliest known manuscript of Dream of the Red Chamber, dated 1754, was housed at Cornell University in Ithaca, N.Y. In 1962, the so-called Jiaxu manuscript, which belonged to the late Chinese diplomat, scholar and Cornell graduate Hu Shih, was "deposited" at the university's rare book and manuscript collections, according to Cornell archivist Elaine Engst. 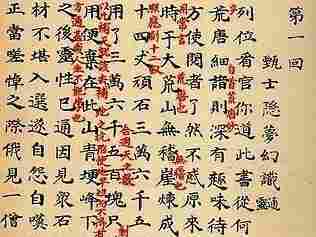 Hu's family reclaimed the manuscript in 2004. 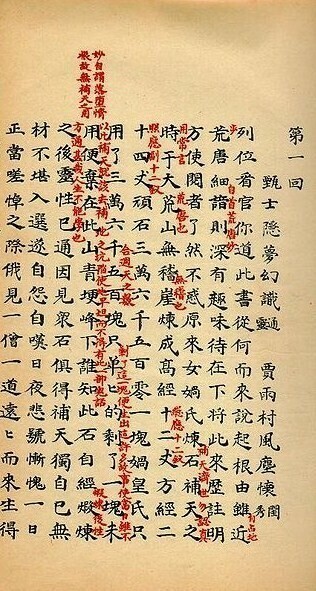 Some of the Jiaxu manuscript's pages contain red-inked notes from commentators at the time. Scholars have used the notes to help interpret passages from Dream of the Red Chamber. There's no roguish Rhett Butler to further complicate the love triangle of Dream of the Red Chamber. But both novels do follow the decline of an upper-class family and, Chen says, both share a similar tension between their female protagonists. "In Gone With the Wind, Scarlett O'Hara is desperately jealous of Melanie Wilkes for most of the book because she loves Ashley Wilkes, Melanie's husband," Chen explains. "But then by the end of the book, when Melanie dies, suddenly Scarlett realizes how much they have gone through together, and that her bond to Melanie is far stronger than what she felt for Ashley." Chen says Scarlett and Melanie remind her of Dream of the Red Chamber's Lin Daiyu and Xue Baochai, who also strike a complicated friendship despite their love for the same man. Their relationship inspired Chen to write her own version of the story with a new, less tragic ending. Chen, who has taught college courses on Dream of the Red Chamber, says early readers of the novel immediately took sides on its love triangle. "Some people liked Lin Daiyu and they loved her spontaneity, her expressivity, her passion," Chen says. "But some people hated her because actually she's also very petty and gets really angry and always goes off in hissy fits over relatively small incidents." In contrast, Xue Baochai is depicted as "even tempered, kind, generous," Chen says. "I think right away, these two women represented kind of the two ways a Chinese woman could be." While it was first published more than two centuries ago, Dream of the Red Chamber still has generations of fans today. 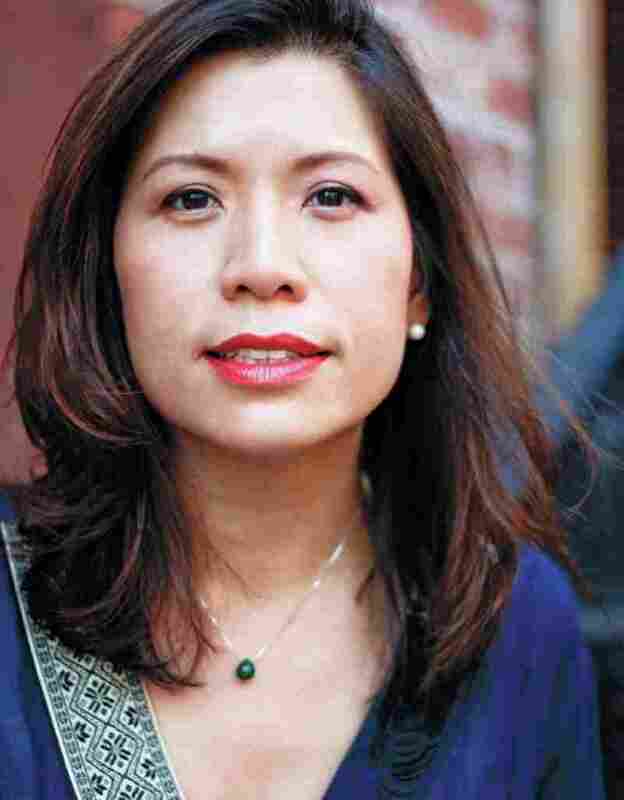 Sasha Gong, who heads the China branch at the international broadcaster Voice of America, has read it so many times she can recite passages by heart. She says she first read it as a young teenager in China during the Cultural Revolution. "When I read it in the early 1970s or late 1960s, it was banned," Gong recalls. "But everybody still loved it." In his youth, even Chairman Mao Zedong was an avid reader of the novel. At one point, Chinese communists celebrated the book for its depictions of bourgeois decadence and of arranged marriages as a backward institution of feudal China. Still, Gong says, "Mao loved a lot of things, [but] he banned everything," especially during the Cultural Revolution, when reading practically anything except Chairman Mao's "Little Red Book" became a political crime. But that wasn't the first time Dream of the Red Chamber was deemed a "bad" book to read. Before the Chinese Communist Party came into power and banned arranged marriages in 1950, parents would often tell their children to stay away from a book that seemed to encourage romantic free will. 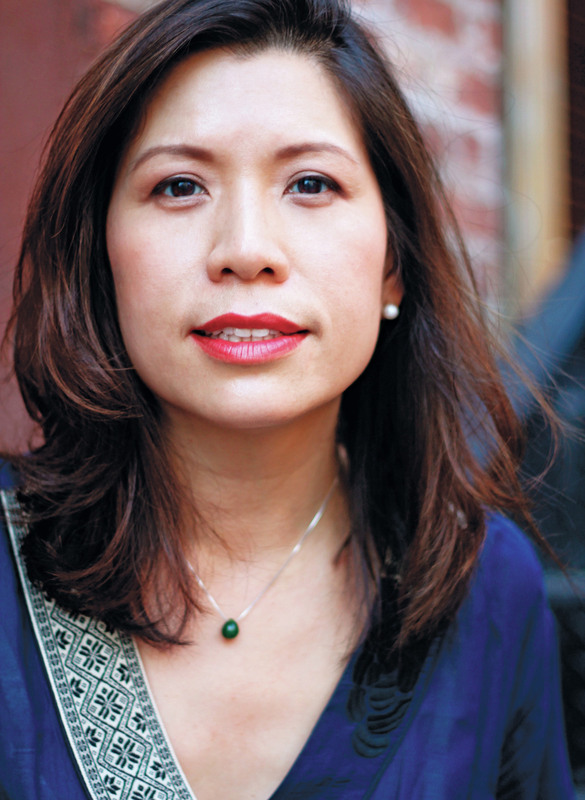 Pauline A. Chen, author of The Red Chamber, studied Chinese literature as a doctoral student at Princeton University. Chen says the novel has always stood out in Chinese literature for depicting a romance that was more a meeting of souls than lust. "And I think that that type of romantic love is an expression of individualism and free choice and personal choice," Chen says. "Even today, China is a society in which Confucianism is still fairly important, and Confucianism is something that emphasizes roles based on hierarchies. And so I think, still, the idea of free love and free choice outside the family is something that's very compelling." The Chinese government lifted its ban on the novel after the Cultural Revolution, and it's now held up as one of China's greatest literary treasures. Casting for its latest television adaptation even inspired a reality competition on state-sponsored television in Beijing. But grandparents can be a different story. Catherine Chen (no relation to Pauline Chen) has read Dream of the Red Chamber twice, first as a middle schooler in China, against her grandmother's wishes. "My grandma said it's not a good novel," Chen, 24, recalls. "She said it's dirty [and] that I shouldn't read [it], especially [a] young girl like me." But Chen says she likes the book anyway. So have generations of readers in China. And now, perhaps, readers in America will too.